Sure, it's great fun to listen to an artist camp it up on a cover song. It's far more courageous, however, for a singer to play it straight, to reinterpret another musician's work without the tongue in the cheek - and from '80s new wave to classic folk, this is exactly what Irish songwriter Luka Bloom does on his fifth album, "Keeper of the Flame". On many of these 12 cuts, Bloom succeeds simply by lending the warmth and lilt of his voice to the song. He enhances Bob Dylan's "Make You Feel My Love" with the kind of vocal beauty and refinement that Dylan doesn't possess. He preserves the austere integrity of Joni Mitchell's "Urge for the Going" by respecting the built-in poetic pacing of her writing, while adding fervor to her tale of wanderlust and inner turmoil, quietly pushing her melancholy ruminations to a fevered pitch. Still, Dylan and Mitchell were obvious choices for Bloom, a gifted writer painstakingly committed to lyrical perfection. But he also throws us a number of curveballs, particularly with ABBA's "Dancing Queen". Bloom treats what could have been a campfest with the same dignity he applies to the songs of his folk heroes. "Feel the beat of the tambourine, oh yeah," he sings quietly, almost forlornly, like a guest who suddenly finds himself alone at some fete. On the Cure's "In Between Days", he turns Robert Smith's plaintive rendition into an up-tempo paean to personal happiness. Bloom even extends his earnest interpretation to Billie Ray Calvin's "Wishing on a Star", a featherweight pop single that's miraculously refashioned into a soulful, Irish-inflected ballad. Using only spare acoustics, including a mandola, accordion, viola and flute, Bloom reinvents this motley assortment of songs. In doing so, he also masterfully manages to restore the context of the dated ones so they survive our current cynical climate. And in the end, that's what distinguishes a successful cover from mere mimicry. Luka Bloom has the gift of song. He can dig out the heart of a piece with nothing more than his voice and acoustic guitar and reveal the song underneath U2's "Bad", the Cure's "In Between Days" or even Abba's "Dancing Queen". This Irish folksinger turns in an absolutely gorgeous outing on his sixth album, starting with the best version yet of Bob Dylan's "Make You Feel My Love" and ranging through material by Radiohead, Joni Mitchell and Bob Marley. It's all uniquely transformed by Bloom's extraordinary abilities. U2 songs have become timeless. As timeless as the Beatles' masterpiece 'Let It Be', the Rolling Stones' trademark 'Satisfaction' and the Doors' classic 'Light My Fire'. But the ultimate tribute to a song is a cover version by another talented artist. Two such artists have recently released albums containing U2 cover songs. On his album 'American III: Solitary Man', the great Johnny Cash chose to interpret 'One', while the most recent endeavor comes from contemporary Irish folk singer/songwriter Luka Bloom. "I love U2, and it was quite natural for me to sing one [U2 song]," Luka told ZooNation. "And 'Bad' is a truly great song." Like the Pet Shop Boys' electro-disco version of 'Where The Streets Have No Name' (which U2 apparently didn't like), Luka Bloom's version of the classic U2 track 'Bad' bears no resemblance to the original version. This is 'Bad' unplugged, Luka's acoustic guitar being the prevalent instrument, as it is throughout the rest of his album. As much as Bono's shouting goes with The Edge's roaring electric guitar, so does Luka's comparatively calm singing with his raw, stringed instrument. Some claim he changed a few of the lyrics to 'Bad', but he was actually only singing from memory. "If I changed some lyrics, it was unintentional," he says. "I didn't have the written lyrics when I learned it and struggled to get the precise lyrics. If I got it wrong, I really hope nobody's offended." Luka Bloom's cover of 'Bad' is featured on his new album 'The "Keeper of the Flame", which was recorded at the legendary Windmill Lane Studios in Dublin, home of many U2 albums. Entirely devoted to cover versions, it is a sort of tribute to artists he admires. "I've been writing songs for many years, and wanted to devote the year 2000 to celebrating the songs of great artists," Luka says. Among the greats celebrated are Nina Simone ('Keeper of the Flame'), who provided the album's name, Bob Dylan ('Make You Feel My Love'), Rose Royce ('Wishing on a Star'), Joni Mitchell ('Urge For Going') and Bob Marley ('Natural Mystic'). "There were many songs I would love to have covered, but this group of songs worked best for me as unit," he says. Luka has managed to transform raggae, disco, rock, new wave and world music into Irish folk music, proving that most songs are flexible enough to be played in different musical styles. The Cure's abstract 'In Between Days' has become a traditional Irish melancholic folk song, while Abba's 'Dancing Queen' has lost all hint of disco glamour. Perhaps the most surprising band to be covered is Radiohead, giving a different sound - and a new meaning - to the track 'No Surprises'. The choice of songs and artists covered are certainly the biggest surprise of the album. The former Barry Moore has embarked on a musical odyssey, which explains the reason behind his pseudonym: Luka is borrowed from Suzanne Vega's hit song of the same name and Bloom is the name of James Joyce's main character in his novel 'Ulysses'. It goes to show that Luka is no ordinary folk singer. His biggest influences are Doc Watson, U2, Joni Mitchell and Neil Young. Very rock 'n roll. He has worked with diverse musicians ranging from rocksters Michael Stipe and Peter Buck of REM to his own brother Christy Moore, one of Ireland's best known folk singers. Christy co-wrote 'North and South of the River' with Bono and The Edge. And Luka would like to follow in his brother's footsteps as far as a collaboration with U2 is concerned. "I would love to collaborate with U2; especially, I would love to open a show for them someday." 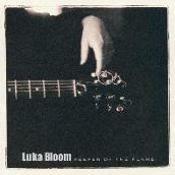 Fans of Luka Bloom will be even more pleased than usual to see the release of his latest album. Luka asked his fans for some guidance as to what songs he might cover on his latest offering. The result: "Keeper of the Flame, a collection of cover versions ranging from an excellent version of U2's "Bad" to Abba's "Dancing Queen. Luka has always been able to show his influences directly by singing the songs of his heroes as well as his own. This is all borne out by the mix of the man's confidence and modesty in real life. Luka quietly plays the music he loves and on this he pays homage to some of the great writers of the 20th century and beyond. My personal favourite in this collection is The Cure's "In Between Days" but there are some other little gems here too. "Wishing on a Star" brought me back to my heady disco days, as does the weird and wonderful rendition of "Dancing Queen". No collection would be complete without a snippet of Bob Dylan and Luka does justice to the often forgotten "Make You Feel My Love". To take it all home Luka tackles a difficult challenge well with U2's Bad, highlighting what a great song it always was. The album also features some of the best musicians from Ireland with the fantastic Trevor Hutchinson of Lunasa on Bass, Nollaig Casey on Fiddle, Mairtin O'Connor on Accordions and of course brother Christy on Bodhran. This album isn't a huge leap forward in music but it a lovely addition to a collection of great albums by Luka and I know you will find yourself singing along with more than a few of the tracks. ... The CD itself is an impressive affair. At first glance, the covers chosen seem to have no particular theme. But with closer inspection, that proves not to be the case. There are, for instance, several songs that are fragile odes to love, not least the title track of the album, Charles Derringer's hauntingly evocative "Keeper Of The Flame". And to listen to Luka sing the lyrics, "Just to have my love, return to me ... True love can't die, it smoulders in the flame ... I'm the keeper of the flame", is alone worth picking up the CD for. He may not believe as he should in his own voice, but he is clearly in fine fettle here. That point is emphasised by another sheer magical vocal moment on Tim Hardin's track, "If I Were A Carpenter". The guitar intentionally breaks off just for a couple of lines, and Luka's voice carries the song through the silence. "Save my love from loneliness, save my love from sorrow, I give you my onlyness, give me your tomorrow." It might seem like and unusual move for someone like Luka Bloom, who is himself a fine original songwriter, to take on an album of covers by artists as various as Bob Marley, U2 and Nina Simone. That, however, is what he has done, and while it might not or probably, should not have worked, on balance it probably does. Wisely, he does not attempt to slavishly copy the originals, but in dissecting and reassembling, searches for other possibilities in their folds. For much of the time too he finds them with Mairtin O'Connor's shimmering accordion and Nollaig Casey's slidy fiddle, casting U2's "Bad" in a completely new light. The understated simplicity of Nina Simone's title track is a lesson well learned - you just don't mess with a great song. Slightly less successful - his vocal pitching seems dodgy in places - is Joni Mitchell's "Urge For Going" where the original is way ahead of the pack. This version seems to me to be way too mannered, something which never could be said about "Wishing on a Star" which bright beautiful and shiny thing is worth the price of the album on its own. With "Keeper of the Flame" Luka Bloom has offered us new perspectives on material that has worn another coat in a previous life. While it doesn't always work, there are still some fine songs here, which have for the most part benefited by virtue of their re-construction. Many others couldn't have done it but then Luka has always been something of a unique spirit. You'll like this. Bloom turns his attention to his favorite songs from over the years by other artists. This self produced effort finds him covering Joni Mitchell, Bob Marley, Nina Simone, even ABBA. As always he puts his own stamp on this diverse collection. It's always exciting to hear what songs inspire artists enough to make their own recordings of them. Irelands premier singer/songwriter returns with his new album "Keeper Of The Flame". A surprising collection of cover versions of some most unlikely songs. Apart from an inspired version of Hunters and Collectors "Throw your arms around me" and effortlessly working his way through songs by Bob Dylan, Jon Mitchell and Bob Marley, he adds his unique touch to RadioHead's "No Surprises" and ABBA's "Dancing Queen". One for music lovers "Keeper Of The Flame" comes for a limited time with a bonus Live CD! Last week saw the release of the latest offering from Kildare man Luka Bloom with his superb new album, "Keeper of the Flame". For the first time in his career, Luka solely performs the songs of other artists. This album is about transformation, not simple interpretation. This is the first time since September 1998 that Luka has released any material. Some of the tracks are songs that Luka seemed destined to do, like Joni Mitchell's "Urge For Going" or Bob Marley's "Natural Mystic". Others, like the Cure's "In Between Days" and Radiohead's "No Surprises" seem utterly unlikely, yet Luka makes them his own. He turns the R and B Classic "Wishing On A Star" into a gentle ballad and reshapes Abba's "Dancing Queen" into something sweetly celebratory. The other tracks on this superb album are "Make You Feel My Love" (Bob Dylan), "Throw Your Arms Around Me" (Hunters and Collectors), "Bad" (U2), "Keeper of the Flame" (Nina Simone) and "If I Were A Carpenter" (Tim Hardin). ... Unsurprisingly, numbers by the likes of Bob Dylan, Joni Mitchell and Tim Hardin are more suited to his rather basic sing and strum style, but he even manages to turn "Wishing On A Star" into a plaintive ballad.... An album of Luka originals would probably have been more invigorating but this is not a bad stop gap. Irish singer/guitarist Luka Bloom says U2's 'Bad' is one of his favorite songs of all time, and that's why it's included on his recent album of cover songs 'Keeper Of The Flame'. The album, which includes covers of a variety of artists from The Cure and Radiohead to Joni Mitchell and Bob Dylan, is Bloom's first album of strictly cover material. In a press biography promoting the album, Bloom explained the inspiration for covering Bad: "It was winter, 1988. Do the gig at the Red Lion in Greenwich Village and decide to take the night train back to D.C. I'm in Penn Station at one a.m. It's a very sad and scary scene there - many walking wounded, cold, huddled, mumbling casualties. By the time the train pulls in, I'm in a dark place inside. I sit on the train and take out my walkman. As the train pulls out of Penn, I stumble across a radio station, the opening notes of the Edge's intro ease into my ears, and I instantly feel connected to something serene and beautiful. I leave the New York skyline to the sound of 'Let it go, and so to fade away...' Somehow, all was well in the world again. I was meant to hear this song, in this way, at this moment."